iPlanner is a powerful utility to bridge the gap between Apple's iCal software and popular paper based planning systems, like Franklin/Covey and Day-Timer. By formatting the data stored in iCal and printing it onto paper planner pages, you'll get the best of both worlds: the powerful time management capabilities of iCal and the tactile friendliness and portability of a paper planner. iPlanner is NOT a scheduling software or task manager. iCal does that just fine. 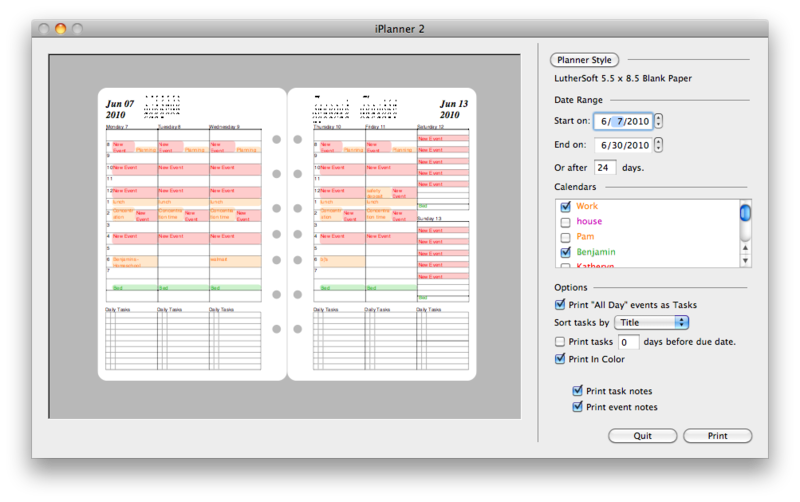 What iPlanner does is take the data from iCal and format it to print onto a paper based day planner page. iPlanner supports printing onto pre-printed pages from Franklin/Covey, Day-Timer, DayRunner, and blank paper. It supports many styles of 2 page per day and weekly formats. iPlanner does not currently support monthly formats. This site does not contain serial number, crack, keygen iPlanner by LutherSoft serial number : serial number is the simplest type of crack. A serial number(cdkey,product key,etc) is register the program as you may already know. a crack or keygen may contain harmful software. If you cannot find the exact version you want, just give it a try. for more information read .nfo/.txt/.diz file include in zipped file.